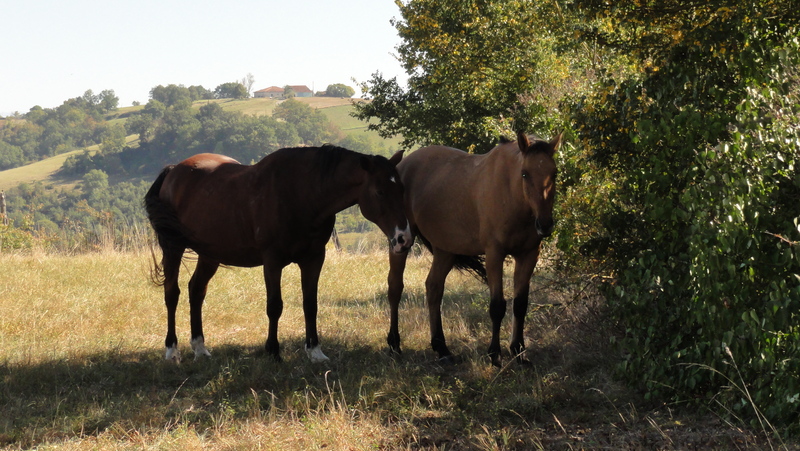 Ever since we bought our French farmhouse, I’ve been eyeing up the small back paddock for horse compatibility. 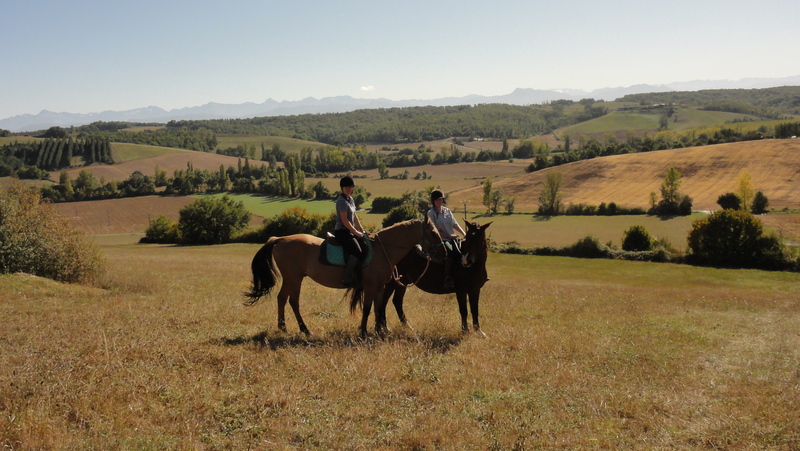 As the grand finale of our autumn trip to France, my riding friend George suggests that we ride two of the club horses back to my village for lunch then ride back in the afternoon. The planned route leads through two forests and involves little road work – and I’m nearly sure I can find the way…. 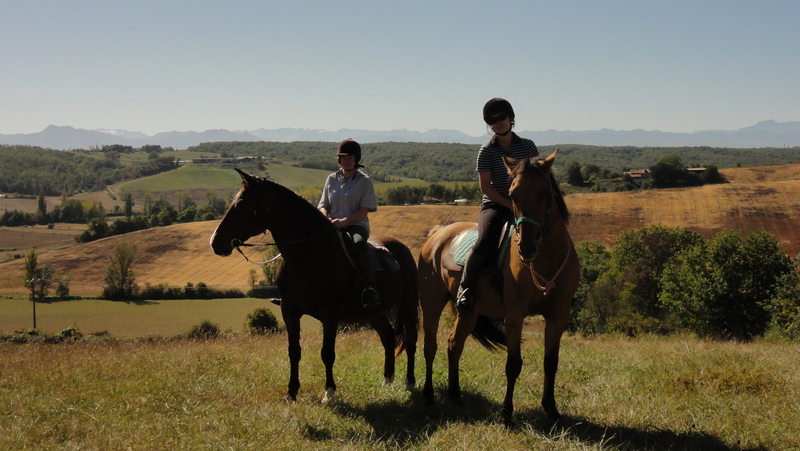 The weather is a sweltering 29 degrees as we set off with Dar, the club’s veteran horse, and Ocean, a tall dun horse with a nice attitude and willing stride. We leave the club field mid-morning, both horses already sweating. An hour’s leisurely riding takes us across the stream, along the back lanes and through the first forest onto a well-defined track. The air is heavy with pine needles and wild thyme. Both horses swing along happily as we emerge onto the ridge and past a boggy watering-hole marked with the hoofprints of wild boar. Crossing the road takes into the second forest where I get us …. erm…..slightly lost. Adopting a rough plan of ‘head downhill and hope for the best’ brings us out on the bottom road at the foot of the house. 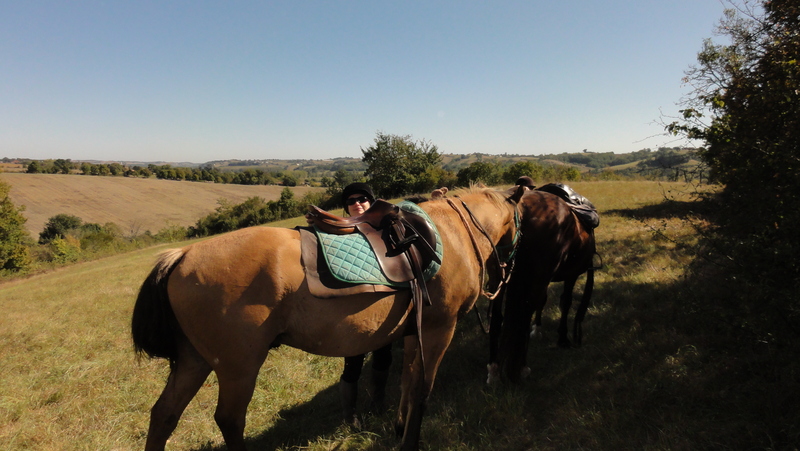 The horses are really hot now, and not impressed to be faced with the steepest hill of the journey. Dar begins to pant in a pointed manner, but eventually we emerge at the top of the hill next to the house. 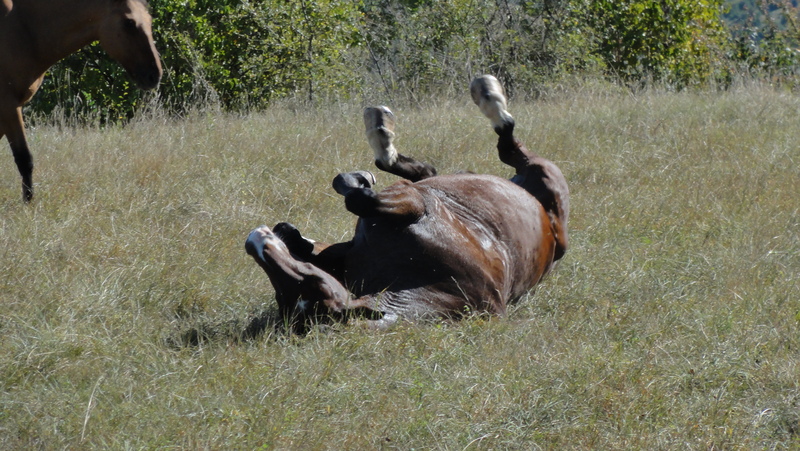 The horses are ecstatic to be unsaddled and allowed to roll. George hastily converts an old bin into a makeshift water bucket, whilst I race round the field tying up holes in the fence. Hot and tired, the horses are desperate to be unsaddled. 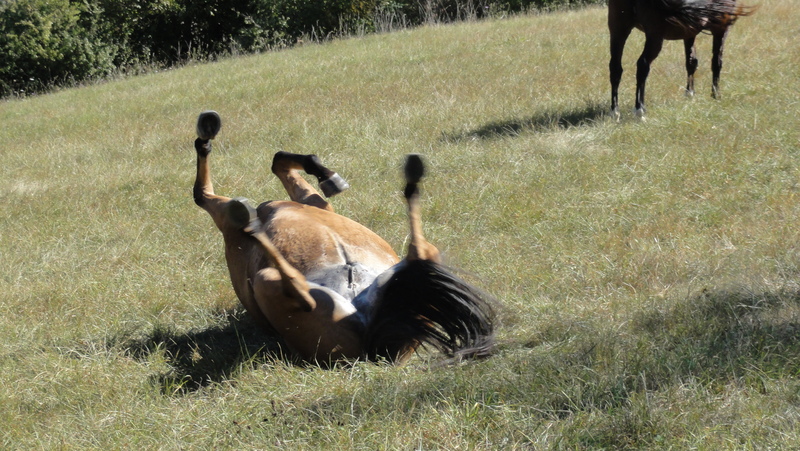 Once hastily untacked, they roll…. We leave them to it and go off for some lunch. This turns into a fairly prolonged affair, partly as it’s too hot to think about riding back and partly due to the bottle of chilled rosé that George was organised enough to drop off earlier. Eventually, we drain our glasses and collect the horses, who are less than pleased to see us. We're fine here, thanks. Ocean and Dar are not impressed. We ride back out onto the hill just as the afternoon light starts to change and the mountains come into view behind the ridge. The ride back to the club is quicker, partly because we decide to stick more to the roads and partly because we leave out my ‘scenic detour’. We arrive back hot, tired but happy, ready to head back home to see if there’s any rosé left in the bottle.